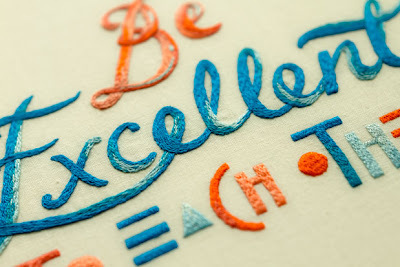 I came across the lovely type and embroidery work of Maricor/Maricar today on Design Sponge and was particularly struck by this piece. 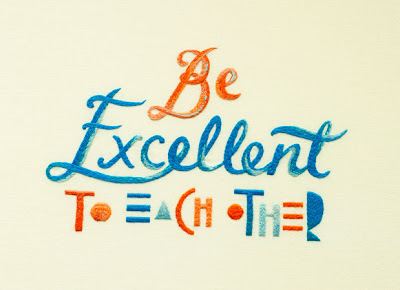 Not only is is a stunning example of embroidery in some of my favorite colors, it's a really good message. My grandmother passed away last weekend at the ripe age of 89, and with the sadness and reflection that a death in the family brings, it has also led me to think about the life I want to lead and the person I want to be. I always try to do the "right" thing, but when I feel taken advantaged of or unappreciated it's so easy to think "Forget it, I'm going to be selfish, too!" But, all in all, I know that's not who I am and sometimes it just takes a little time to see the kindness in others. I have recently been blessed with many kindnesses, from good friends to total strangers, and I know that the tough times are worth it. So, just keep being your most excellent self, for others, and just for you. Cause it's who you are. Thanks for teaching me lots, Grandma. We miss you already. I'm so sorry to read your grandmother passed away, Casey. I can tell she was a very special person and a wonderful role model. There's a great deal of wisdom in the embroidered words and also in yours. The blog is reflecting the diversity of the field. There are many areas to cater and discuss in detail.